SYSPRO Bill of Materials facilitates an accurate expected cost against which to track actual production costs. The complete bill forms the basis for material and capacity planning, shop floor control and costing. You can create and maintain a model of your manufactured or assembled products as well as generate what-if costing scenarios. 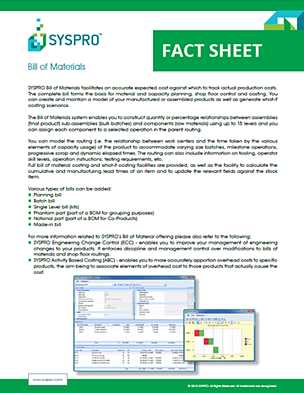 Complete the form to receive instant access to the fact sheet about Bill of Materials with award winning software by SYSPRO. Get the Fact Sheet Now!